This cemetery has a 4-foot chain-link fence with a gate and is about 50 feet square. It is a small family cemetery and is well kept. The cemetery is exactly across the road from the Wilson Cemetery #97. These cemeteries are deeded together as the Wilson-Moore Cemetery #238. The Wilsons and Moores were related by marriage. Addison Wilson married Ann Moore. 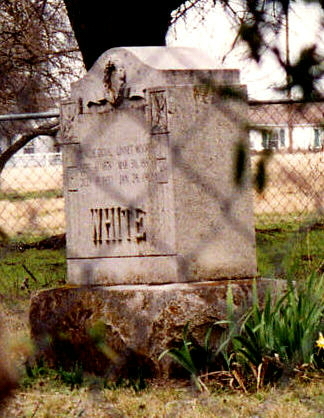 The Moore Cemetery is visible from CR 228, while the Wilson Cemetery is hidden by growth along the fence. 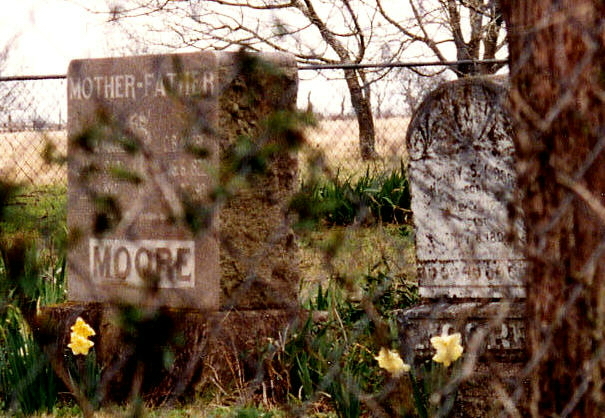 According to COLLIN COUNTY CEMETERY INSCRIPTIONS I, Charles B. Moore and his brother, Henry Stewart Moore, came to Collin County in 1857 and purchased some 800 acres north of McKinney in the John Emberson survey. In 1866 Charles and Henry brought their father, Ziza Moore, and his second wife, Matilda, to Texas. Charles and Henry Moore were millwrights by profession and farmers. Henry never married but Charles married in 1875 at the age of 53. He went back to Tennessee and married Mary Ann Dodd. They had one child, Linnet Moore. All of these people are buried in this cemetery.